Well, I wrote about the Labor of Love way, WAY back in February 2013, and finally, FINALLY it’s just about done. 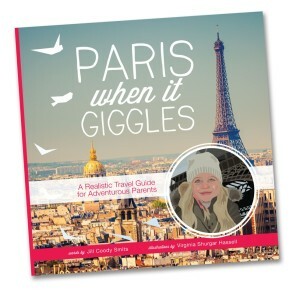 There are many wonderful travel guides for Paris, but I don’t think there’s anything quite like this…travelogue, picture book and city guide all rolled into one pretty little package. I’m waiting on the second proof as I type, and hopefully I’ll be able to say I’m a (self-) published author by next week. It’s very exciting, and it’s been great fun working with awesome illustrator Virginia Shurgar Hassell to create something we are both proud of. I’ll write more soon about the process of getting here, our hopes and professional goals in a post-bestseller career phase, and how soon we expect book sales will enable us to retire.